So many random thoughts come to mind when you first hear the name Tyrese Gibson. His devotion and hard work resonates across many different areas. Beyond his obvious background of actor, father, and singer you would be surprised to know that he’s also an author and has an interest in martial arts. 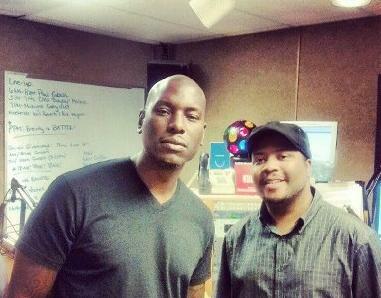 Recently, I had the privilege to see the human side of Tyrese when I interviewed him on my afternoon drive radio show. He had just came off a long flight, hectic media tour around Memphis, and was operating on nothing but a bag of Cheetos. His walk was slow and his speak off-microphone was very little, however; when the on-air light came on Tyrese quickly became one of my favorite celebrity interviews. His wisdom was compelling and his advice was practical. Listen to the interview below!